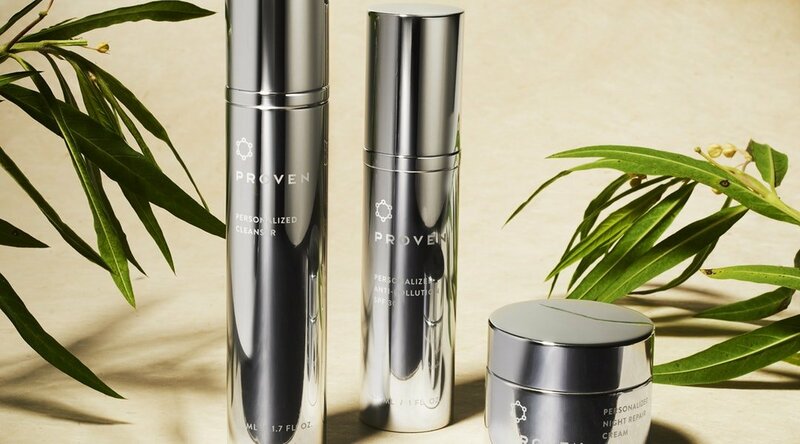 Recently I had the opportunity to try Proven Skincare. This company is a little different than others because they design a very personalized routine and products geared towards your very specific needs. First, you fill out a detailed questionnaire about your skin (answer questions about your age, ethnicity, skin type, air quality where you live, how much sleep you get etc.) then they create products for exactly what you require. There are 20,238 ingredients in the Proven Skincare database and they use only those for your specific skin genome. Each customer receives three products addressing their concerns: a cleanser, day cream, night cream. I love the cards that come with the kit, each one gives important information on ingredients plus a little about each product. For example, the card for the Cleanser which I love because it’s gentle and creamy shows ingredients plus it shows that this product does not contain parabens, alcohol, phthalates, and no SLS. It contains hydrating ingredients plus antioxidants, lavender oil, rose oil, ylang-ylang oil, and gentle exfoliants. I use this cleanser every night and it can even be used to remove mascara. I also love the day cream- named Anti-Pollution SPF 30. Because I live in smoggy California, they took into account the air quality so this product contains Anti-Pollutants. I use this every day, especially on my neck, chest, and hands. The Night Cream is another fabulous product which I use without fail every evening. This one is for my specific needs and includes ingredients to help with wrinkles, fine lines, discoloration, getting older is so much fun…NOT. I am grateful for good products like these! This cream is created with Granactive Retinoid, Copper Tripeptide, Hyaluronic Acid and more, I love these ingredients because they all serve a specific purpose. I think this is such a brilliant idea, tailoring each person’s products to address their very specific concerns. And with three products, you aren’t overloaded with various serums, oils, balms, sprays, and creams. Paring down your routine to the essentials is a wonderful and highly effective idea. When I travel, I like to bring only what I absolutely need- and Ill be bringing these with me. For more information, please visit the Proven Skincare website here.